Bibies Bed & Breakfast is situated in the sparkling heart of De Pijp neighbourhood, at Frans Halsstraat number 30-1, where you will find a restfull accomodation. De Pijp is also called the Latin Quarter of Amsterdam. The neighbourhood is known worldwide for its lively streets, shops, restaurants, cafes, terraces and authentic Amsterdam charm. All this makes this neighbourhood a favourite spot for Amsterdammers and tourists alike. We have two lovely large bedrooms available, one overlooking the street and the other one overlooking the back garden. 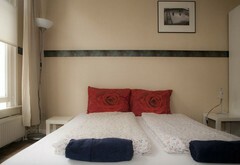 Both rooms have a double bed, an extra twin bed, television, table and chairs. Both rooms are lockable from inside and outside. Furthermore, there is a common living room, kitchen, separate toilet and bathroom with shower. In the living room is a computer with Internet access. The kitchen includes all the necessary luxuries, including microwave and coffee machine. We provide everything you need to make yourself a delicious continental breakfast, including bread, cheese, meat, fruit, eggs and coffee/tea. The B&B lies on the first floor and so it is necessary to climb one flight of stairs to reach the rooms. Policies : " First come First served "
What to see & do : The Van Gogh museum and The Rijksmuseum ate around the corner of the B&B. As well as the famous Albert Cuyp Market and The Vondelpark.